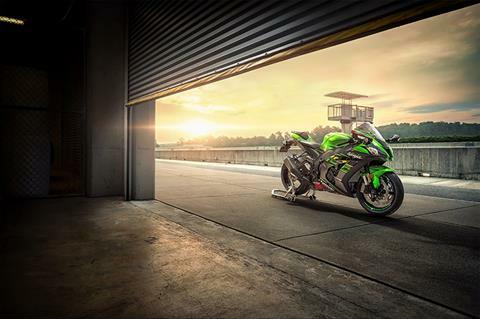 No other supersport can claim the Superbike World Championship like the Ninja® ZX™-10R. 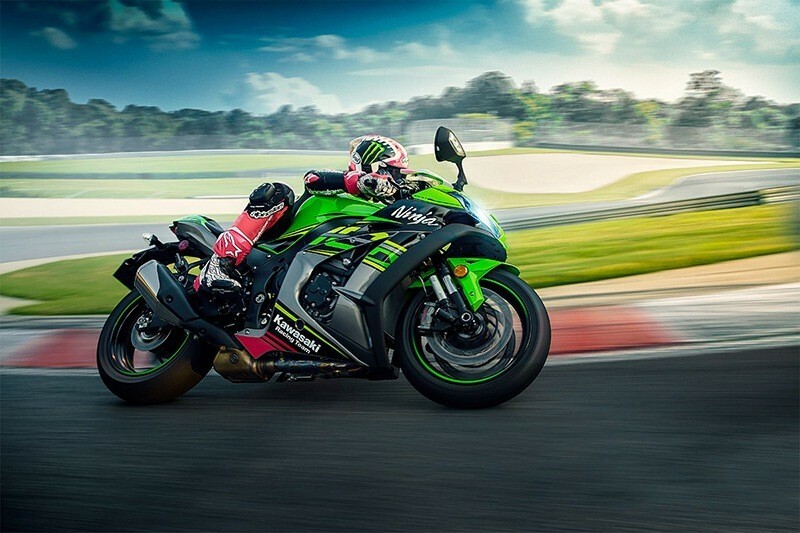 The Ninja ZX-10R propelled Kawasaki rider, Jonathan Rea, to win the championship title for the fourth consecutive year—marking the first time any rider has won four WorldSBK titles in a row. Down to the finest details, everything that goes into the Ninja ZX-10R has the sole purpose of making it the fastest bike on the track. 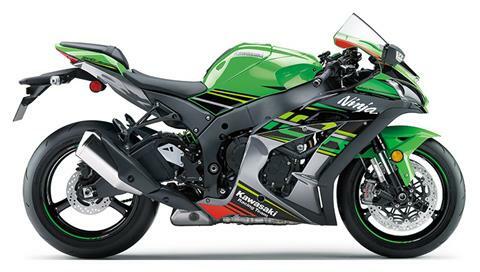 And as a direct recipient of what the Kawasaki Racing Team (KRT) learns, the Ninja ZX-10R is equipped with championship-proven technology that makes it fully capable of also dominating the streets. 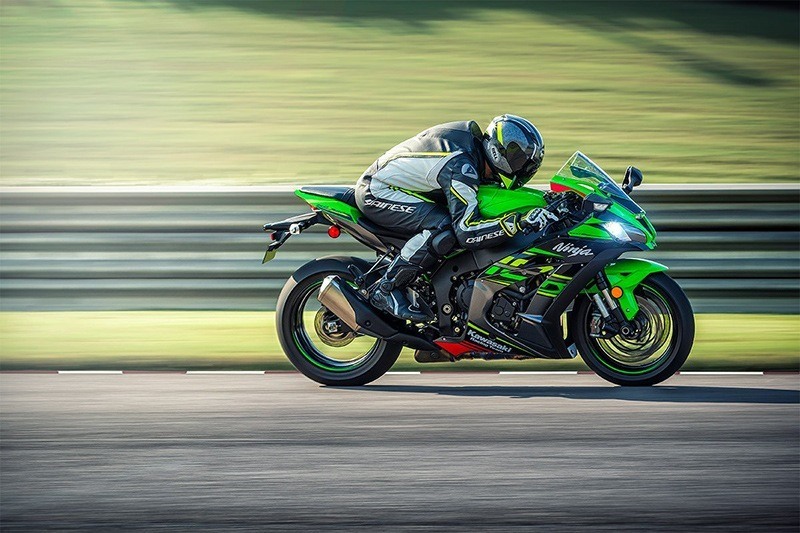 For 2019, key updates include an Öhlins Electronic Steering Damper, new dual-direction Kawasaki Quick Shifter, and a more powerful track-ready 998cc engine. 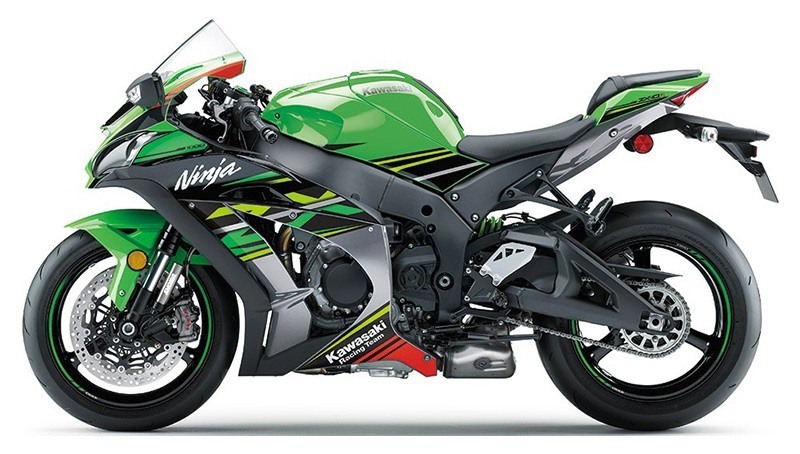 CHAMPIONSHIP-PROVEN HANDLING: Showa's advanced 43 mm Balance Free Fork (BFF) brings state-of-the-art WorldSBK racing suspension technology to a mass production supersport motorcycle on the Ninja® ZX™-10R. The benefits include increased ride comfort, enhanced braking balance, increased front-end feel and independently adjustable compression and rebound damping. BREMBO BRAKES: Front Brembo brakes feature a pair of massive 330 mm semi-floating discs that deliver superb braking force and brake feel. The rotors have a grooved outer edge for effective heat dissipation. The brake system features dual radial-mount Brembo M50 cast aluminum monobloc calipers, Brembo's highest grade mass production brake calipers. The Brembo radial-pump master cylinder and reservoir are calibrated to require very little lever movement to achieve strong front brake force. Stainless-steel braided brake lines contribute to direct feel at the lever. 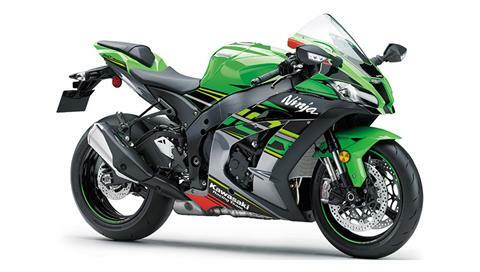 SHOWA SUSPENSION: Showa's advanced 43 mm Balance Free Fork (BFF) brings state-of-the-art WorldSBX racing suspension technology to a mass production supersport motorcycleon the Ninja ZX 10R. The benefits include increased ride comfort, enhanced braking balance, increased front-end feel and independently adjustable compression and rebound damping. Horizontal Back-link Rear Suspension featuring the compact and lightweight Showa Balance Free Rear Cushion (BFRC) shock. STYLING: Upper cowl reduces drag and provides optimal wind deflection so that the racer can change position more smoothly at track speeds. Stragegically-placed vents in the upper cowl help prevent negative pressure build-up in cockpit to reduce helmet buffeting. Vented front fender directs airflow to the radiator for improved engine cooling. EVEN MORE POWERFUL: Massive power. Refined power. Dominant power. New for 2019, the 998cc engine is updated with a finger-follower valve actuation to increase engine performance and deliver more power across the entire rpm range. TITANIUM ALLOY EXHAUST SYSTEM: Heat resistant, lightweight and low center of gravity for effective mass centralization and light handling. LARGE AIRBOX: 10-liter airbox improves engine response and increases low-to mid-range power. LARGE AIR FILTER: Air filter has large surface area with low air resistance to contribute to improved engine performance. ELECTRONIC THROTTLE VALVES & ECU: 47 mm electronic throttle valves and 32-bit ECU operate with great precision to provide smooth engine response on the track. ENGINE: Internal engine designs focus on producing peak power and delivering strong low-to mid-range power for quick acceleration; lightweight crankshaft and pistons, straight, wide intake and exhaust ports, lightweight titanium intake / exhaust valves, 6-speed cassette transmission, back-torque limiting clutch. CHASSIS: Optimized geometry for maximum feel, feedback and flickablility. Frame and swingarm contribute to sharp and great cornering speed. Reversible offset collars (race kit parts) allow steering and swingarm pivot positions to be asjusted to best suit track conditions and riding style. BOSCH IMU (INERTIAL MEASUREMENT UNIT) - Compact IMU enables inertia along 6 Degrees of Freedom to be monitored. Acceleration along longitudinal, transverse and vertical axes, plus roll rate and pitch are measured. The yaw rate is calculated by the ECU using Kawasaki’s proprietary dynamic modeling software. This next-level system enables predictive and adaptive electronics for precise chassis orientation awareness. S-KTRC (SPORT-KAWASAKI TRACTION CONTROL): Hybrid predictive / feedback-type evolution of the highly sophisticated traction control system helps racers push harder by maximizing acceleration. 5 modes enable a greater range of feeling for specific track conditions and riding preferences. 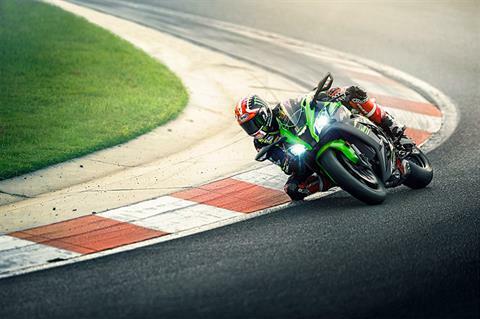 KIBS (KAWASAKI INTELLIGENT ANTI-LOCK BRAKE SYSTEM): Kawasaki’s supersport-grade high-precision multi-sensing brake ABS brake assistance system. Uses high-precision control to modulate brake pressure during sport riding . KCMF (KAWASAKI CORNERING MANAGEMENT FUNCTION): Input from the IMU enables a control function: cornering management, which assists riders in tracing their intended line through the corners on the track. ELECTRONIC STEERING DAMPER: Specially developed Öhlins® electronic steering damper provides just the right amount of damping based on vehicle speed and degree of acceleration or deceleration. POWER TECHNOLGY: Kawasaki next-level electronics bring the extraordinary power of the World Superbike-winning Ninja ZX™-10R to stunning new levels. 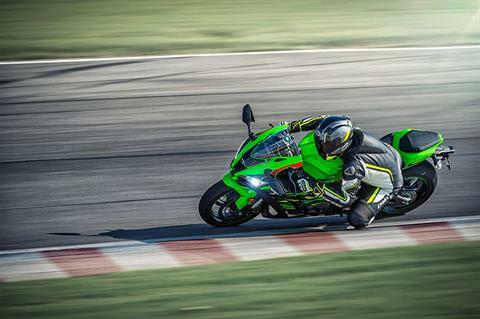 KLCM (KAWASAKI LAUNCH CONTROL MODE): 3-mode system designed to help racers optimize acceleration from a launch. Manages engine output to prevent wheelspin and minimize front end lift. KAWASAKI ENGINE BRAKE CONTROL: This system allows riders to set engine braking according to preference. KQS (KAWASAKI QUICK SHIFTER): Now standard on all models, dual-direction KQS system facilitates acceleration by allowing both clutchless upshifts and downshifts while on the track. KQS can also be used on the street above 2,500 rpm. POWER MODES: Riders can set power delivery to suit conditions and/or preference ; Full (100%) mode, Middle (80%) mode, low (60%) mode.